For two generations, the Koch family has funded and collaborated with a network of corporate donors, free-market extremists, politicians, and white supremacists (the subject of Chapter 3). This network’s current incarnation is the “Seminar Network,” politically-active billionaires and multimillionaires orchestrated by Charles Koch, which meets twice per year. The Charles Koch Foundation provides these donors with a “fully integrated” strategy where targeted funding goes to an integrated system of academics, non-profit organizations, political front groups, and politicians. These privately-controlled institutions align to transform the donor’s extremist “ideas into action” with industrial efficiency (read more here). In the remainder of this report, we will refer to these donors as the “Koch network." Through the 1950’s and 1960s, many early figures in the Koch network (including the Kochs) actively fought against the Civil Rights Movement. Many of these figures were members of violent white supremacist groups (subject of Chapter 3 below). For decades, this network has aggressively fought to roll back civil rights laws, while serving as the architects of the modern prison industrial complex. One of the key enablers of the Koch network’s political success is the American Legislative Exchange Council (ALEC), which allows its corporate funders to draft and advance legislation through a network of corporate-funded legislators. ALEC helped launched a network of free-market think tanks called the State Policy Network (SPN). ALEC has received long-term financial support from private prisons and corrections contractors while serving as a key source of legislation that allowed for-profit prisons to boom. It was responsible for the creation and spread of the "tough on crime" political narrative as well as the draconian laws which filled-up the private prisons. Some famous ALEC laws include the Minimum-Mandatory Sentencing Act, Truth in Sentencing Act, “Three-Strikes-You’re-Out” laws, and bills allowing juveniles to be charged as adults. 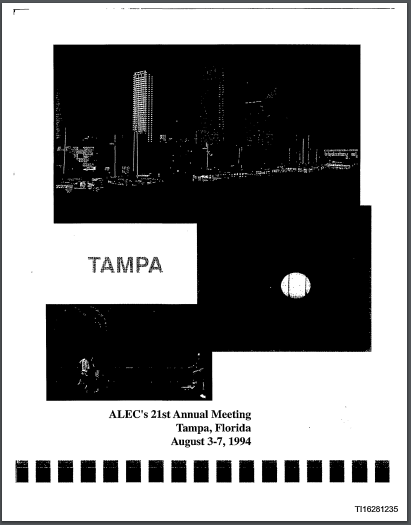 ALEC also pioneered legislation that expanded prison labor, including the "Prison Industries Act." Since 2010, many of the exact same ALEC and SPN reformers who led “tough on crime”are leading the current public narrative on criminal justice reform. Fronted by a group called Right on Crime (ROC), these groups are once again pushing pro-corporate criminal justice reform. Key figures are Jerry Madden (Right on Crime), Vikrant Reddy (Charles Koch Institute), Mark Levin (Texas Public Policy Foundation), and Pat Nolan (Prison Fellowship and with the American Conservative Union Foundation). These groups, as well as nearly all of other groups and individuals leading Right on Crime, are active within ALEC and the SPN. Pat Nolan was Vice President of Prison Fellowship Ministries, whose subsidiary, Justice Fellowship, was active in ALEC’s Public Safety and Elections task force. Nolan served alongside private prison officials and private bail advocates on ALEC’s Private Sector Executive Committee. More recently, Madden and Nolan have co-chaired ALEC’s Corrections and Reentry Working Group. In addition to helping white-collar criminals like Koch Industries, Right on Crime’s reforms seek to expand and privatize post-incarceration “reentry” services while leaving all the primary problems with the criminal justice system unaddressed. This would allow the prison industrial complex to not only survive, but to dig its roots deeper and provide bigger returns (the subject of Chapter 4). In this context, Marshall DeRosa’s state certified program shows a clear opportunity for free-market extremism and white supremacy to be further injected into corrections facilities. This concern is not just a matter of circumstance, but is rooted in the fact that key figures in Right on Crime have close ties to hate groups, including the League of the South. This includes the League of the South, whose longtime member and board member, Michael Peroutka, can be seen serving on CNP's Board of Governors. For context, Peroutka’s LOS membership was not a secret. He openly courted them while he was the Constitution Party’s candidate for President of the United States in 2004, and became a board member in 2013. After the LOS was designated a hate group in 2000, Peroutka remained a key figure for fourteen years. Hate groups active within the Council for National Policy include the League of the South, Alliance Defending Freedom, National Organization for Marriage, Catholic Family and Human Rights Institute, the American Family Association, the Pacific Justice Institute, Liberty Counsel (whose Mathew “Mat” Staver served on the CNP’s Board of Governors), Family Research Council (whose Tony Perkins is CNP Vice President and Kenneth Blackwell was on CNP’s Executive Committee). The CNP members that are striving “for unity” with hate groups were described by the New York Times as “a little known club of the most powerful conservatives in the country,” more specifically, a who’s who of figures in Right on Crime, the American Legislative Exchange Council, the State Policy Network, and the Koch network. The signatories of Right on Crime’’s Statement of Principles are described as some of the “most influential figures in the conservative movement.” A quick glance shows that the Council for National Policy is listed as a supporting organization, with the rest of the signatories made up of an alarming number of CNP members and officers, including Pat Nolan (Prison Fellowship and American Conservative Union Foundation), Kathleen Hartnett-White (Texas Public Policy Foundation), Tracie Sharp (State Policy Network), Grover Norquist (Americans for Tax Reform), Edwin Meese III (Mercatus Center and Heritage Foundation), David Keene (National Rifle Association), and at least seven other CNP members (including anti-LGTBQ hate groups). Key figures in the Koch network have been active members and officers of the CNP, including several who served on CNP's Board of Governors alongside the League of the South’s Michael Peroutka and other hate group leaders. Specifically, Tim Phillips of Americans for Prosperity, John Templeton Jr. and Foster Friess (Koch’s frequent partner donors), and other insiders like the Federalist Society’s Leonard Leo and Michael Grebe, (Philanthropy Roundtable/Bradley Foundation). Both Rich DeVos and the Edwin Meese III have served as CNP presidents. 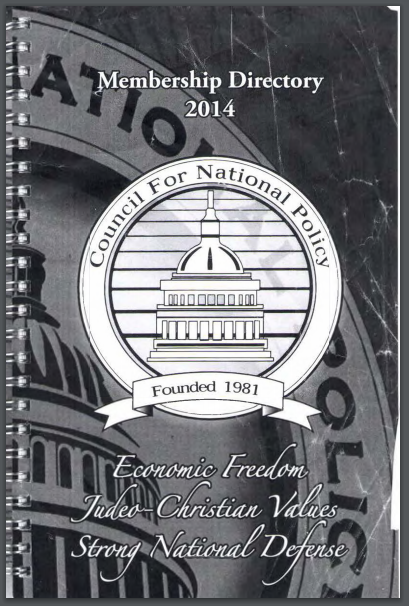 In a 2015 speech to the CNP, William Walton brags “Most of my career has been spent in business and on Wall Street and I was among the first to attend the Charles Koch seminars.